Kinsella on Liberty Podcast, Episode 046. 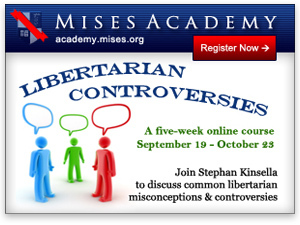 This is lecture 2 (of 6) of my 2011 Mises Academy course “Libertarian Controversies.” This talk covered more common libertarian misconceptions such as PDA jurisdiction, Big-L vs. small-l libertarianism and other misused terms, non-aggression “axiom” or principle, and other issues. Slides for this lecture are appended below.